I like the Mercury, at least if it’s the same as the French language edition that the old archivist at the Kriegsarchiv Staatsarchiv threw into the appropriate folder every now and then. Probably not, but a nice, helpful touch for future historians. Contemporary newspapers are indeed a treasure trove, once you decide how to interpret them. C.T. Atkinson wrote several articles way back when using English newspapers to glean more info on British efforts in Spain (the forgotten theater) during the Spanish Succession – they mostly focused on identifying the duties of particular regiments. 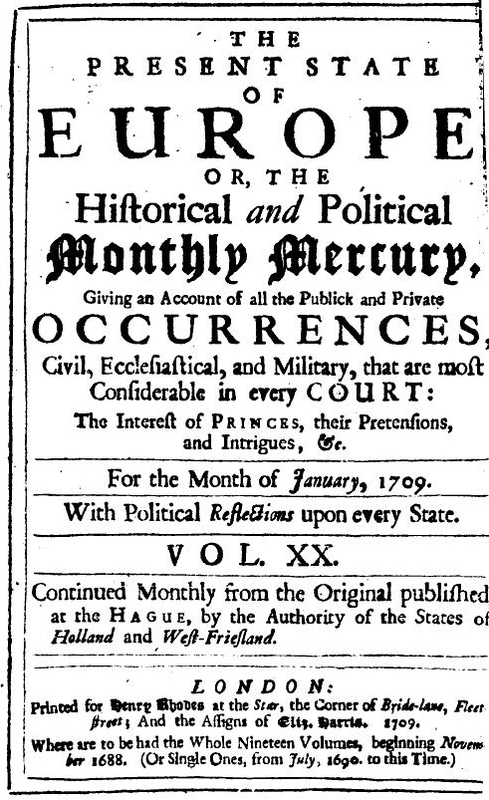 By the time my diss was finished, I’d only looked at a few, particularly the Mercure galant and the Daily Courant, and I think I probably photocopied all of the Europische Mercurius 1702-1712 when I was researching at Michigan. But I’ve made up for that since: resources like Adam Matthew, Google Books, Hathi Trust and the Burney collection online now make it so much easier for us to find them – assuming you can afford any subscription fee, or have access to a free trial and can set everything aside in order to download. In a downloading frenzy a few years ago I downloaded English 8,000 issues just for the period 1701-1712. Of course it’s even more annoying that I’m still missing various issues, but I guess that’s the collecting compulsion in me. Jack Censer has a short clip that I show in my methods course on interpreting papers, for anyone interested. There are a couple more along the same lines at GMU’s Center for History and New Media World History Sources. What EXACTLY Python does | Skulking in Holes and Corners on Where have you been all my life?